After the Hurricanes’ first Atlantic Coast Conference loss against Clemson, Miami heads to North Carolina to face the Duke Blue Devils. Entering its fourth ACC game of the season, Duke (8-7, 0-3 ACC) has failed to secure a conference victory in 2019. Despite their disheartening ACC record, the Blue Devils are 5-1 at home and their lone loss was to No. 4 Louisville. Duke is led by redshirt junior guard Haley Gorecki, one of the ACC’s top scorers, averaging 17.1 points per game. She is also second on the team with 6.0 rebounds per contest. Back in the 2017-18 season, the Hurricanes defeated the No. 14 Blue Devils 51-48 at the Watsco Center. UM coach Katie Meier returns to Cameron Indoor Stadium, looking to lead Miami to its first win over Duke in program history. Meier, who was inducted in the Duke Hall of Honor in 2002, is one of the most accomplished Blue Devils ever. Meier was the 1986 ACC Rookie of the Year, a 1990 First Team All-ACC selection and a four-time All-ACC Academic Team pick. 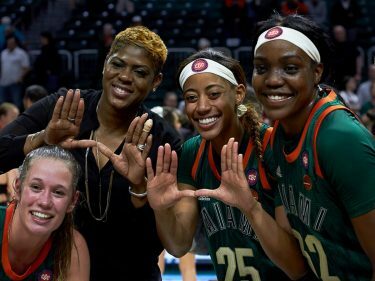 The Canes (14-4, 2-1 ACC) will have to rely on their two post players, Emese Hof and Beatrice Mompremier, to out-rebound the relatively smaller Duke squad. Miami has averaged 43.3 rebounds per game compared to Duke’s 37.9. Both teams will definitely score more than last season, but the end result will be the same. 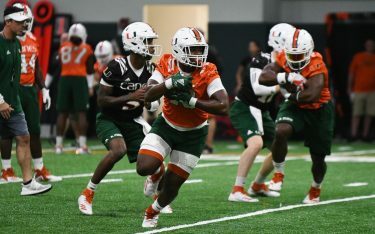 While the Hurricanes head home to Coral Gables, they aren’t done with teams from North Carolina. North Carolina is having a very similar season to its instate rival, Duke. Playing just two more games than the Blue Devils, the Tar Heels and have not won a conference game this year. They also lost to No. 4 Louisville, 73-66. Adding onto their dreadful conference record, they are 1-4 on the road in 2018-19. But, unlike Duke, UNC (9-8, 0-3 ACC) has a center that can match up to Hof and Mompremier. Sophomore Janelle Bailey has shined in her second year leading the Tar Heels in points and rebounds. With 17 points per game and 8.9 rebounds per game, the 6-foot-4 center has shown she can make an impact on both ends of the court. Miami still has the advantage with two veteran centers, as well as home court advantage. It will be closer than Duke, but the Canes will be able to secure the victory at the Watsco Center to make it four straight wins over the Heels.